Lauren in her SF home. Q: I love … Start out with a tough one why don’t you? It took me a bit to land here, but I love learning something new/expanding my horizons. This can come from so many places - a trip with my family or friends, a book, a class, a podcast, a random chat with a friend, spending time with my baby… the universe is ginormous and I certainly don’t have all the answers, so continuing to learn and grow is huge for me. There are so many things I love about making and designing jewelry. I love playing with all of the materials. I am a rock lover, so touching precious and semi precious stones is a big part of the fun. I also adore designing in the jewelry universe. In a former life I was an Art Director/Creative Director in the advertising world, so I used to design and concept for commercials and magazine ads. It’s been a great joy learning how to translate my design aesthetic into precious 3-D objects. I also love the people I’ve been working with and meeting. I am part of a showroom called “For Future Reference” that reps independent female jewelry designers (Brent Neale, Established, Emily Wheeler, Retrouvai, Sarah Hendler, Sorellina). I’ve had the chance to really get to know a lot of these women and they are incredibly inspiring. Lauren’s designs and an Encourage Vintage cardigan. We had fun mixing a few of Lauren’s pieces with some shiny and sparkly Encourage Vintage things. 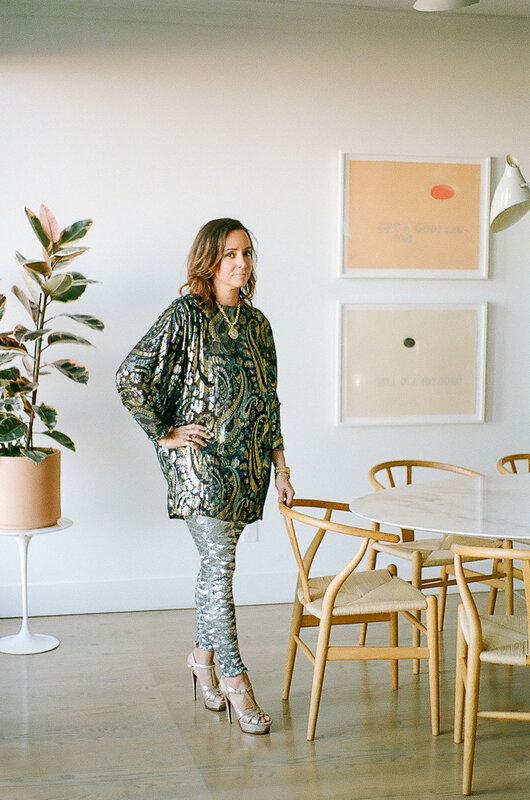 Lauren wears her own vintage sequined pants. Lauren’s vintage jewerly collection … we could have a whole separate feature there folks. It’s good. Looking through piles of incredible vintage jackets to shoot!!! 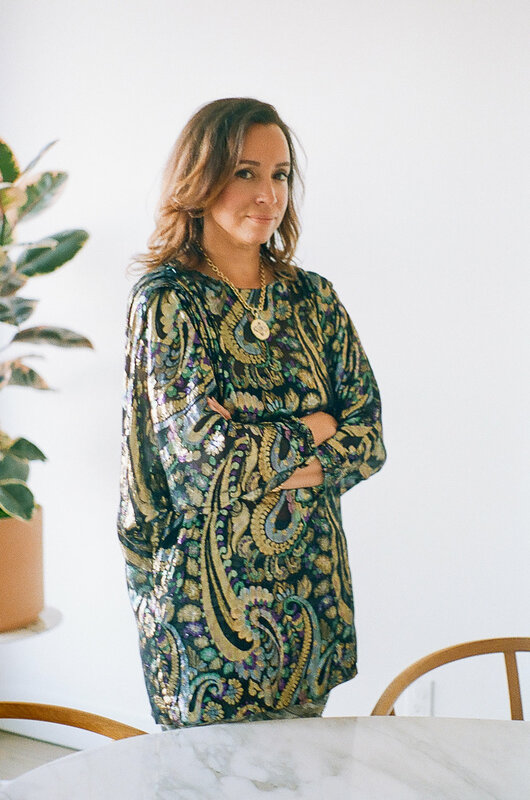 Q: My most treasured vintage piece is… my vintage green velvet YSL smoking jacket. 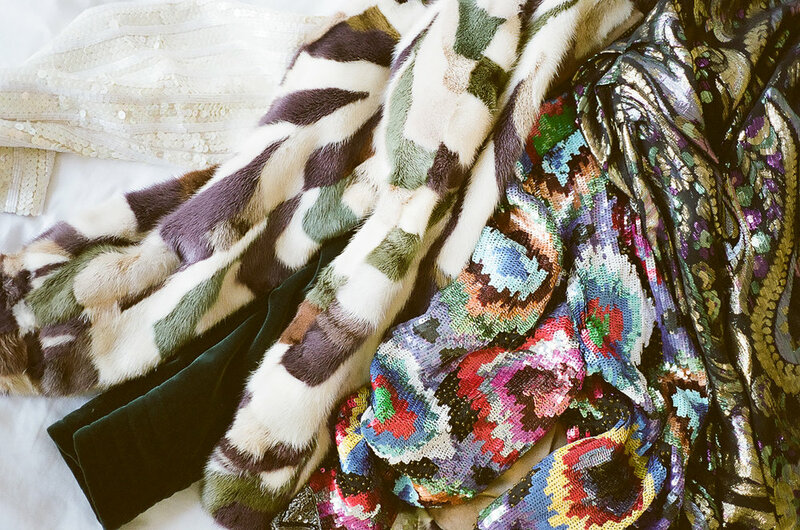 Q: The secret to finding good vintage is … patience and trusting your eye. I think vintage shopping can be overwhelming, because there’s often a lot to sift through. If you keep your eyes open you can find the best things in the most surprising places. Q: I’m always on the hunt for … sunglasses. I can never have too many sunglasses. Just ask my husband. Lauren wears an oversized Encourage vintage blazer and her own vintage cutout tee + jeans. A few more of Lauren’s vintage jewels, plus some favorite boots from our friends at Freda Salvador. Q: If I had a day all to myself … I would work on an ambitious cooking project and throw a dinner party for family and friends. I also LOVE to cook! Artwork and branches in Lauren’s light filled kitchen. Lauren, thanks for taking the time to share about your life and your loves with us! You can follow her journey here and see her website here! If you have a friend who you’d like to nominate slide into my DMs on instagram! 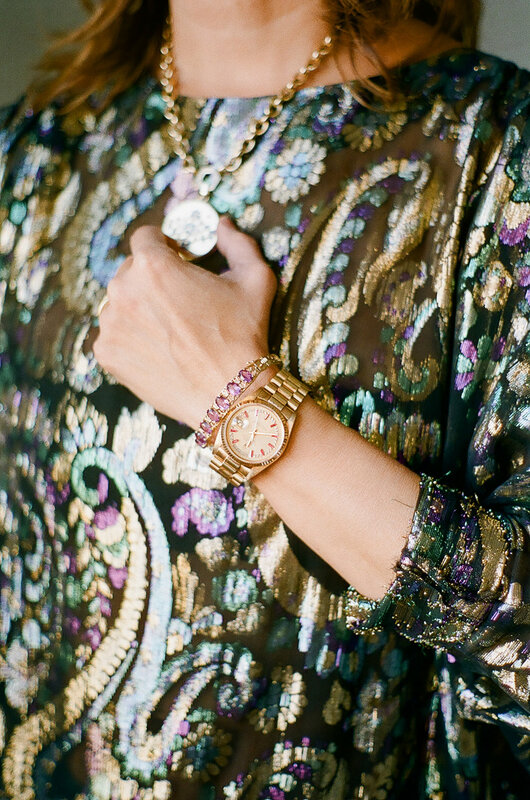 Lauren Godfrey of Harwell Godfrey Fine Jewelry gives us a peek into her incredible vintage wardrobe.